Imagine a wedding set among lush, green vineyards or beautifully manicured gardens, with a lake or mountain view as a backdrop. Penticton & Wine Country offers a variety of venues to add that certain, ‘je ne sais quoi’ to your wedding day. Revel in the romance of a vineyard setting at Poplar Grove, Painted Rock or Bench 1775. Enjoy barefoot bliss at the Sandy Beach Lodge & Resort or get that vintage vibe on the SS Sicamous Paddle Wheeler. 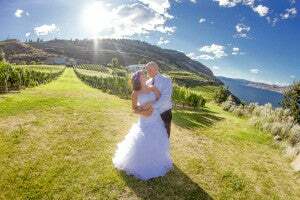 The ambient temperature of Penticton makes it an ideal location for outdoor wedding ceremonies, including early spring and late fall, when there is still plenty of sunshine and wonderful seasonal colours to enhance the beauty of your big day . 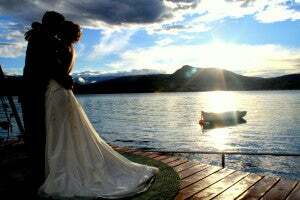 The Penticton Lakeside Resort and the Summerland Waterfront Resort and Spa are great options for Lakeside nuptials and both offer a range of wedding services to ensure plain sailing on your big day. For something a little different, why not experience a white winter wedding above the clouds at Apex Mountain Resort. Your wedding memories will be with you forever and who better to help preserve them than local expert photographer, Shaun Kennedy, owner of Moments Under Frame. Shaun is always looking for that one perfect moment to hold onto and will strive to make you big day picture perfect.